This was a surprisingly easy and delicious appetizer to prepare. I have had several versions of commercial dulong spread in olive oil that were sold either bottled or in other containers at food bazaars and I honestly never thought to try making them myself. 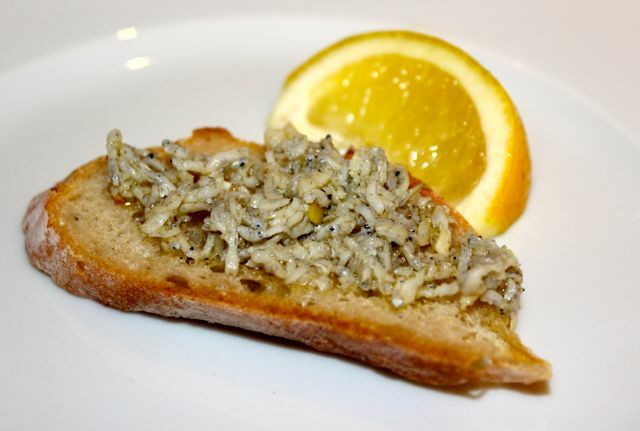 Similar to spanish boquerones (in oil rather than mostly vinegar) or even angullas (real or faked), the dulong in olive oil makes a great appetizer or spread on toast. I spied a simple sounding recipe in the current April issue of Apetite magazine credit to Atty. Gabby Concepcion, and decided to give it a go. I changed the proportions of ingredients slightly, and omitted others, but feel free to make your own adjustments. I took about 1/4 kilo of market fresh dulong and quickly rinsed them tap water and drained them. In a small saucepan, heat up about 1/2-3/4 cup of olive oil and sauté 2 tablespoons of finely minced garlic and one finely minced ailing labuyo (or some dried chili flakes) for a minute or so over low heat, just until fragrant, and not browned. 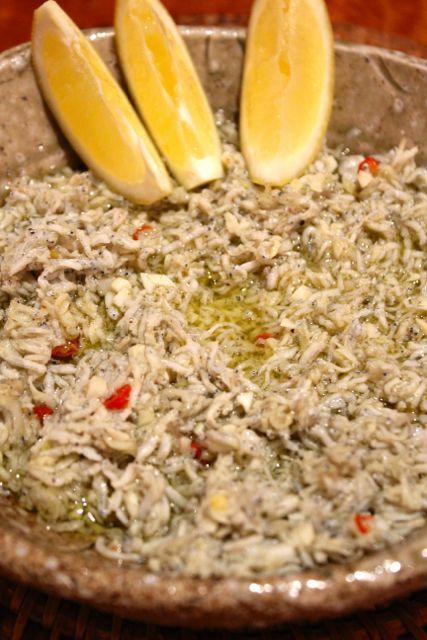 Add the dulong and a couple of fresh bay leaves and sauté for a minute or two. Add 2-3 Tablespoons of crisp white wine and let the liquid evaporate. Season with salt and pepper. I then removed the dulong into a small bowl, and boiled down the liquid until it was mostly oil which I poured over the dulong. Let this cool for several minutes before serving with a garnish of Italian parsley and some lemon wedges. We served this with toasted slices of french bread. The dulong benefits from a couple of hours of marinating in the garlic oil, so feel free to make this a few hours ahead. nice, MM…i’ve always thought most of the bottled dulong sold around si overpriced, and i’ve had some that were either really mushy and tasteless, or overly salty. some market vendors pre-salt dulong in the market, so i always do a thorough rinse before cooking. Tortang dulong revisited: MM, read your old post on this topic and you asked how others cook their tortang dulong. 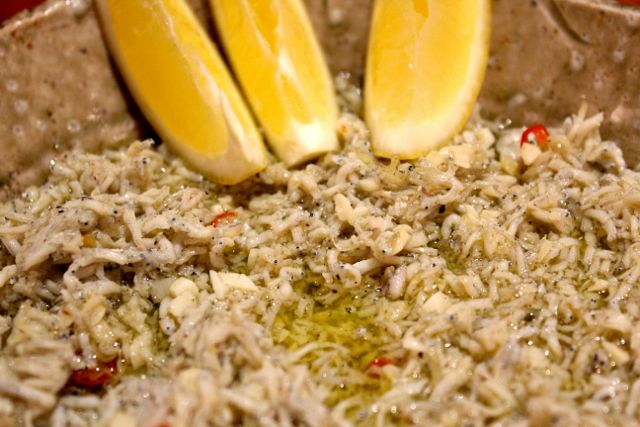 I cook mine with lots of chopped regular or sweet onions and scallions then add a dash of Old Bay seasoning or freshly prepared crab seasoning from the fish market. My omelet is moist with crusty margins ( perhaps due to the cornstarch rather than flour) which I like, and this recipe does that for me, the Old Bay seasoning adding a zing to it. This is something I have to cook back home. ConnieC, I like the old bay twist. I have to get a can the next time I am in the States. I read somewhere that there is a Buddhist principle that says, it is better to sacrifice a single soul to feed many than to kill many animals to feed one person. And it looks like a lot of fish sacrificed their lives for this. Lol! But I’m not here to preach that.. this Dulong spread looks totally delicious! Hmm, now where can I get dulong here in Vancouver/Richmond? =) As a change from Old Bay, I was given a Cajun seasoning by a client in NOLA, it’s called…and I kid you not “Slap Yo Mama” ! =) I’ve made a nice almond praline with it and it was GOOD!